Is it a coincidence that the field of psychiatry is suspected, in Bernard Schreiber's research, to be involved in a continuation of holocaustal crimes against humanity since Hitler's holocaust. . .that, according to General Barrie Trower, microwave weapons began perfecting their ability to remotely inflict symptoms that mimic "mental Illness" in targeted individuals in the 1950s. . .that the field of psychiatry was making shifts from Freudian methods to medicatable "mental Illness" diagnosis in the 1950s. . .and then (thank God) along came people like Dr Thomas Stephen Szasz to stand up for humanity against what he classified as false "mental illness" labels? In my first edition of "Embracing Feelings" I strongly encouraged people to work out personal issues through embracing/releasing suppressed feelings, instead of taking medications. The first edition of this book was completed in 1999 and was followed by severe rounds of targeting which ended in the loss of 3 pets, loved ones and a suspicious fire that raged through my New Hampshire home...etc. I am not sure if this round of targeting happened solely because of my book. It does appear to be due to other things also. But, the final manuscript, along with most of my other writings, were lost in the fire. And due to how much interference I had while reconstructing it, it was obviously part of the reason for vamp ups in the targeting. But who would want my work destroyed? And why? My work, was not offensive or threatening - it was all about healing the heart of humanity and bringing more Love into our troubled world. The only types of people, whom I’ve thought could be apposed to it, had to be some sort of dark occult. But could it have been a threat to some other sort of organization? My drive to encourage healing instead of medicating, grew from my own experiences with personal growth and things I'd witnessed in a mental health facility, which I'd worked at. I found that through embracing our feelings we can heal from past trauma and that medicating our issues prevents resolution and stalls or prevents personal growth. Even without meds, the "mental illness" labeling can destroy a person's life. I believe that there are many children and adults who were being labeled although they are perfectly healthy and just needed to be encouraged to allow a healthy grieving process or outlet for their frustration...etc. People who are labeled as mentally ill can lose their rights to take care of themselves and make decisions for themselves - their work and/or home can be taken over by relatives. In the worst of situations they can be forced into institutions and medicated against their will. This form of destruction of healthy human beings is probably the worst kind of crime that humanity has ever been faced with, because most victims are not aware and the full scope of the crimes are not yet recognized or fully exposed. I'm not a doctor. But, when I wrote the book, I had a lot of experience with the embracing of feelings, in order to heal from past trauma, instead of suppressing it with medications. I personally trust the wisdom of experience and instincts above scientific text book knowledge, when it comes to personal growth, because every individual's issues and circumstances are unique and no book can cover them all. But, for those who need a Dr. label, in order to believe that we have a serious problem here, I've compiled statements from doctors and other scientific experts. I feel that the crisis humanity is faced with has multiple dimensions which are summed up in the first paragraph of this article. Some are so obvious that investigations are probably already taking place. And some may be difficult for you to believe, especially if you are not aware of the capabilities of microwave weapons and how psychiatric pharmaceuticals aid their mind control applications. Please become aware. The following doctors have waged a war against the psychiatric label of "mental illness" and the harmful pharmaceuticals that are either prescribed for or forced upon victims of the label, which comes from the DSM - the book which defines criteria for the diagnosis of "mental illness." Some psychiatrists are even concerned that the labels and psychiatric drugs are so unethical that it could destroy the credibility of the whole psychiatric profession. Dr Thomas Stephen Szasz appears to be the pioneer in the movement to save the field of psychiatry from the shame of unethical "mental illness" labels and harmful medications that they justify. On the battle to save humanity from harmful pharmaceuticals Szasz says, "The task we set ourselves to combat psychiatric coercion is important. I think its important. . .not enough people think its important. Its a noble task - a task in the pursuit of which we must, regardless of absticles, persevere. Our conscience commands that we do no less." Dr. Szasz wrote a book called "On the Myth of Mental Illness" and says that "there is no such thing as mental illness." 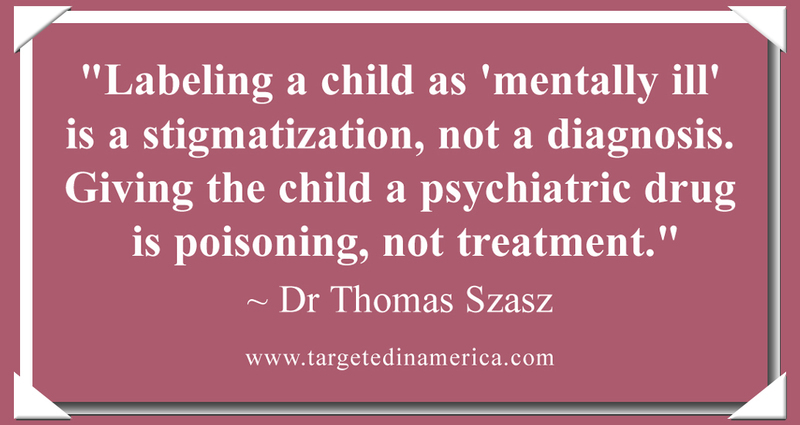 Szasz says that ""Labeling a child as 'mentally ill' is a stigmatization, not a diagnosis. Giving the child a psychiatric drug is poisoning, not treatment." I was so glad to have found Dr. Szasz. Thank God for his courage and insight. and how they can deprive people of their rights..etc. Dr. Peter Breggin makes a strong stand against the psychiatric labeling and pharmaceuticals on an interview with FOX News in the videos below. Breggin calls the psychiatric drugging "medication spell binding" and that they do "more harm than good." His focus is more on the violence that drugs can instigate in victims. There is, however, a danger that those, who are not aware of the technological part of the targeting, can easily blame psychiatric pharmaceuticals for severe cases of technological targeting like in the Navy yard shooting, which Breggin blames on a pharmaceuticals. I feel that it was both. The shooter was obviously being targeted. Dr Jeffery Schaler went so far as to say, "The diagnosis of mental illness is always a weapon." Bernard Schreiber, wrote a book entitled "Men Behind Hitler - A German Warning to the World." In this book, (which is freely downloadable on the web as a gift for humanity) his research exposes the profession of psychiatry being involved in a covert continuation of the eugenics movement. Schreiber's book is "Humbly dedicated to the memory of countless ordinary people who's lives were taken because they were considered less than perfect, and therefore, unworthy to live." The History of Psychiatry; Age of Fear: Psychiatry's Reign of Terror was "Filmed in Germany and Austria, The Age of Fear contains shocking personal testimony and revealing inside footage that tell the true story of psychiatry, whose reliance on brutality and coercion has not changed since the moment it was born." Potent quotes from this video; "Far from being places of healing, psychiatric institutions have always functioned as the worst sort of prisons. . .where someone can be incarcerated against their will without even being charged with a crime." and "This is an industry that doesn't just specialize in destroying people's lives, it kills their souls." Microwave expert, General Barrie Trower describes microwave weapons , and their use on human beings since the 1950s. On the subject of the use of microwave weapons on human beings Trower says, "By changing the pulse frequency... of the microwaves going into the brain and interfering with the brain. . . you could induce psychiatric illnesses to the point where a psychiatrist could not tell if it is a genuine psychiatric illness or an induced psychiatric illness."" He describes these weapons as technologies which shoot beams of microwaves into space to bounce off of the ionosphere and be redirected to the target, which can be virtually anywhere in the world. His description fits technologies like the Russian SURA and the American HAARP. (At least six of these types of technologies are reported to exist around the globe.) This sort of targeting would also have to be done in conjunction with satellite surveillance systems and some of these are privately owned. According to experts the mind control parts of Microwave Weapons are most successful on people who are taking mood altering drugs, like anti-depressants. Aside from the book I wrote in 1999, there is one more thing I did before hell broke loose around me. I’d had a prophetic dream, which showed criminal contamination of a public water supply and had shared my concern about it with a few people, including the water department. But many difficult years passed, as I struggled to survive the targeting, before I found the following information and realized that this is probably what my dream was warning of. In 2008, news reports stated that pharmaceutical drugs, including antidepressants, were being found in around 24 major public water supplies throughout the USA. In 2013 a secretary at a New Hampshire Environmental Protection Agency told me that these drugs are STILL being found in our public water supplies! Reports say that its from the "run off” of pharmaceuticals that are improperly disposed of. Perhaps those who are coming to this conclusion are not aware of the microwave and pharmaceutical targeting of humanity? Because of the dream I had about criminals putting toxins in public water, and the fact that I had this dream while I was focused on writing a book to help steer humanity toward healing, instead of medicating. . .I believe that the drugs are being placed into the water by groups of criminals who are involved in a covert continuation of the eugenics movement, which includes efforts to control human beings with microwave technologies, which are aided by mood altering drugs. Whether the drugs are from “run off” or intentional contamination the resulting problem remains the same and something needs to be done to stop it. I understand how unreal this all sounds. But PLEASE think about this and DO NOT STOP thinking about it until you feel/know the absolute Truth. Too much is at stake for it to be washed away with blind disbelief. Even when we put aside the unpublicized technological part of these crimes against humanity, the process of falsely labeling, and inflicting healthy human beings with harmful pharmaceuticals, are still holocaustal crimes against humanity, especially when those human beings are rendered too numb to freely live their lives or when they lose their credibility and right to make their own choices with their own lives. But please do not push aside the technological part. 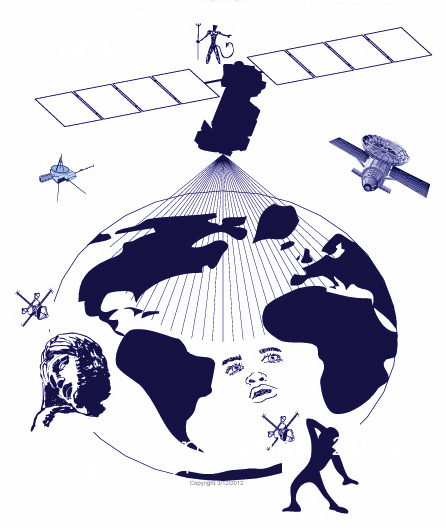 Criminal use of microwave weapons and satellite surveillance systems is a critical problem that must be faced and stopped as quickly as possible. People’s lives are being destroyed! Why would people be targeted in ways that could make them go see a doctor and get labeled as "mentally ill," and either prescribed or forced to take, harmful pharmaceuticals? Who would put drugs in our water? Who benefits from this destruction of lives? I believe that the root causes are greed and evil. . .and that we ALL need to do what we can to stop these crimes and save humanity from further destruction. With peaceful non-acceptance of the evil seed. Please print and share this information with everyone you know. P.S. What are the dangers of so many people being pushed to take psychiatric pharmaceuticals for having natural human feelings and issues? I feel that there are many. . .some of which have probably not yet been realized by even the field of science. Tampering with the brain of human beings interferes with the natural process of personal and spiritual growth, which I feel is what life on Earth is all about. The damage that is being inflicted upon people is immeasurable. And some situations are even worse - some people are being literally tortured. Many have reported being targeted with microwave weapons, laser weapons, mind control technologies....etc. These people are commonly known as "Targeted Individuals." I have heard that many of these victims have been forcefully labeled as "mental ill" instead of being protected from further abuse. The destructive and discrediting "mental illness" labels are just part of the horrible crimes that are being committed against heavily targeted people. I am a victim of technological targeting and have had to fight against the “mental illness” label which I have not been inflicted with, but certainly not out of their lack of trying to shove me in that direction. I am fighting to not become another labeled pharmaceutical victim on top of all the other parts of the targeting, which are more than any human being should have to live with for ANY length of time. It is Truly insane that any human being would have to fight to not be falsely labeled as “mentally ill” or force medicated by criminals who are also targeting us with microwave weapons! The hell that we are going through soars beyond inhumane. The targeting has sabotaged nearly every aspect of my life. I used to own a nice country home and now I live in a vehicle as I fight to expose these crimes. Many others are experiencing similar levels of targeting. We are suffering indescribably. Its taken me a while to pull this article together! I was shot with painful doses of microwaves when I first found Dr. Szasz on the web in December 2014. I was not able to start fleshing out this article until around February 5, 2015 and then there appeared to be an aim to prevent me from posting and printing it as I continued to be heavily targted with microwaves. Finding validation for the psychiatric crimes was a huge relief for me and it gives credibility to information I’ve been sharing, and have often been degraded for, for decades. I hope it helps you to not only realize what is happening, but to also make the healthiest of choices for yourself and your loved ones. Its OK to have natural human feelings. they are actually a prerequisite for personal growth. And we all need to be growing and evolving into all that we are meant to be. PLEASE LISTEN TO YOUR OWN HEARTS AND INSTINCTS AND STRIVE TO HELP STOP THESE HORRIFIC CRIMES AGAINST HUMANITY.